A young mountain lion is fighting for his life after rescuers were lucky enough to find him among the rubble and ruins of California's rampant wildfires. The 3- to 4-month-old cub was found early last week, underweight and singed from the flames. At 9.1 lbs, the mountain lion kitten is underweight and fragile. A state veterinarian will continue to carefully monitor its health and recovery. 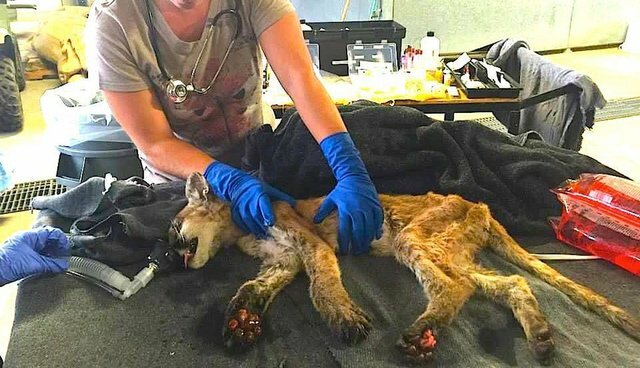 Even his paws were burned, and the California Department of Fish and Wildlife (CDFW) sprung into action to help the ailing cub. The male kitten is estimated to be three to four months old. It was recovered with burns and singe marks on the pads of its paws and around his face. "The young cat was walking but appeared to be emaciated and injured. The volunteers were able to capture it without much difficulty," the CDFW said. The cub is being carefully monitored as he recovers, but he will probably not be able to return to the wild, the CDFW said on Facebook, due to the extent of his injuries. The burned pads on the kitten could have occurred from walking across a hot forest floor. "CDFW staff are hopeful it will make a full recovery and be a candidate for permanent placement in a wildlife care and education facility," CDFW stated. Vicious wildfires in California have claimed lives of people and animals and destroyed 1,000 homes . But some survivors are emerging as signs of hope . Learn how you can help wildfire survivors here. The young lion waits for another checkup by WIL staff. And if you find an animal in distress, call your regional office of the California Department of Fish and Wildlife.